Despite the recent correction in the Euro/rally in the US Dollar, which has exerted some pressure on Dollar-sensitive assets such as gold, the case for a major top in the US Dollar & bottom in gold is still very much intact for now, although with some work still to be done as outlined below. 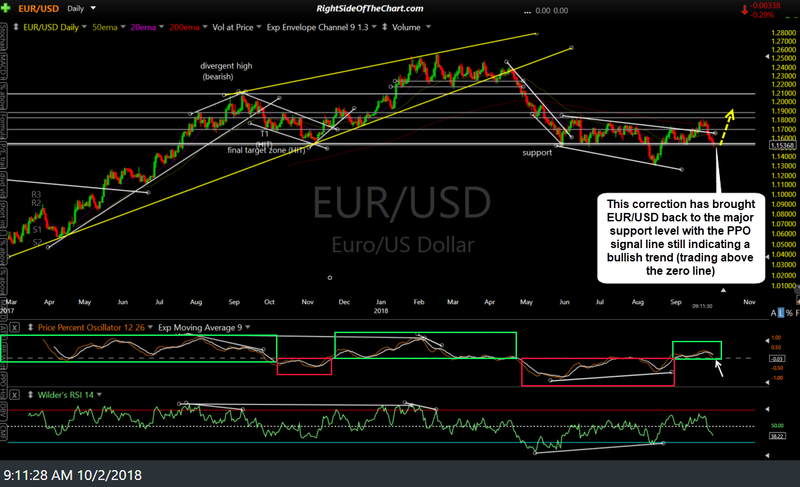 This correction, which was foreshadowed by the last September divergent high & trendline break on the EUR/USD 60-minute chart, has brought EUR/USD back to the major support level on the more significant daily time frame with the PPO signal line still indicating a bullish trend (trading above the zero line). 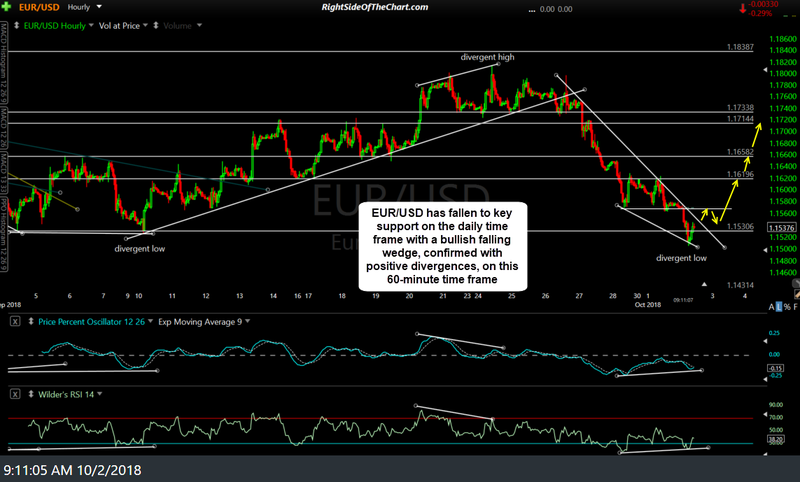 In additional to falling back down to key support on the daily time frame, EUR/USD has also formed a bullish falling wedge, confirmed with positive divergences, on this 60-minute time frame. In today’s pre-market session, /GC (gold futures) regained the 1196.62 support/resistance level on an impulsive rally, most likely as savvy traders anticipate a reversal of EUR/USD based on the technical case outlined above. 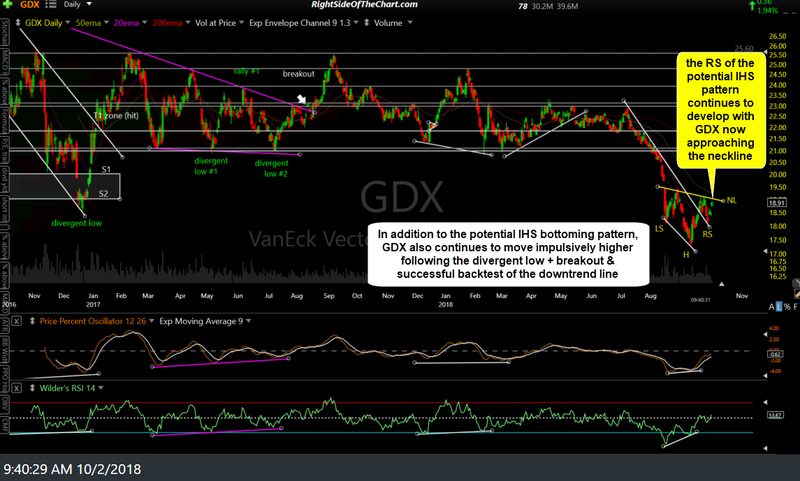 I am still awaiting a breakout above the intersecting 1213 & downtrend line resistance levels for a buy signal on /GC. 60-minute chart below. 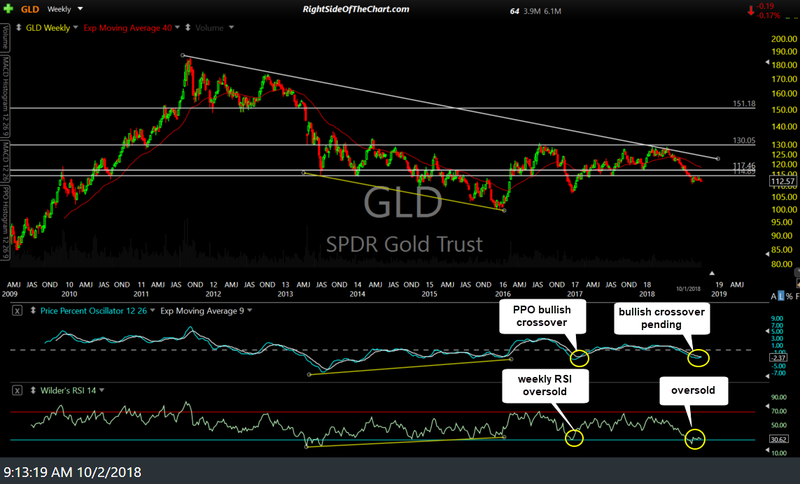 From the longer-term perspective, I am also awaiting & expecting the a bullish crossover on the PPO of the weekly chart of GLD (gold ETF) following the recent rare oversold reading, similar to the oversold reading & subsequent bullish PPO crossover back in late 2016/early 2017 that came at the start of the sharp 23% rally on GLD. The right shoulder of the recently highlighted Inverse Head & Shoulders bottoming pattern continues to develop with GDX now approaching the neckline. In addition to the potential IHS bottoming pattern, GDX also continues to move impulsively higher following the divergent low + breakout & successful backtest of the downtrend line. Impatient by nature, i’m itchy to add more gold positions. Should i wait for a pullback? Depends. /GC is still just below that key 1213 + downtrend line support on the 60-minute. EUR/USD is in a near-term downtrend & has fallen to key support where I “think” a reversal (from at or slightly below) this level is likely but none of those things have happened yet (/GC breakout or EUR/USD successfully bouncing off support or breaking out above that 60-min falling wedge). 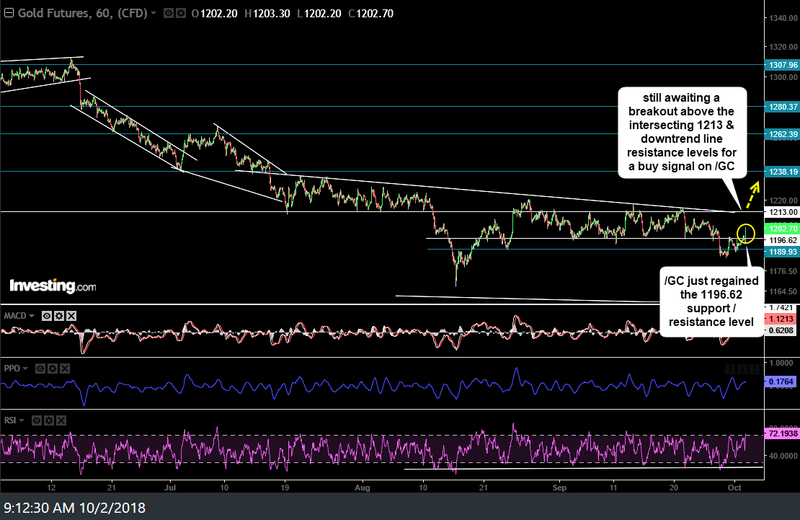 As such, adding to gold & related positions (platinum, miners, etc.) here is what I can an “anticipatory” trade, which is somewhat aggressive & runs a higher chance of failing, should those potentially bullish developments above fail to materialize. On the flip side, you can go the conventional route of trading which is to go long on a breakout or once it is clear that the key support in EUR/USD held with the pair rallying off that level & taking out the 60-minute downtrend line. Simply put: The former, more aggressive strategy results in a more favorable entry price albeit with an increased rate of failure (being stopped out) on the trade while the latter, more conventional option provides a higher chance of success but a less favorable entry price. Your call but it does not have to be an “all or none” decision as one could scale in with partial positions here, adding on the breakouts.